I almost forgot to tell you—we rolled out the red carpet! Rolled it right up and out of the house to the dump. As much as we valued this carpet for nostalgia's sake (cough, cough), it was time for it to go. For it's aesthetics, yes, but more so because it was completely unsanitary—perpetuated by a slow leak in the toilet. 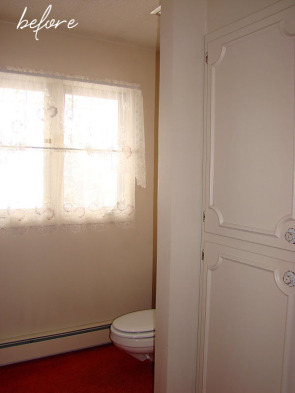 Yep, sorry, this post is about a bathroom, after all. It was a dirty job to remove as it was glue-down rubber-backed carpet that had to be scraped up. So, when we ordered our carpet for the basement, we asked the floor guy if he had a cheap piece of vinyl he could sell us. 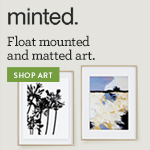 He offered this piece for $100, and we agreed sight unseen. We really didn't care what it looked like, but it didn't turn out half bad. 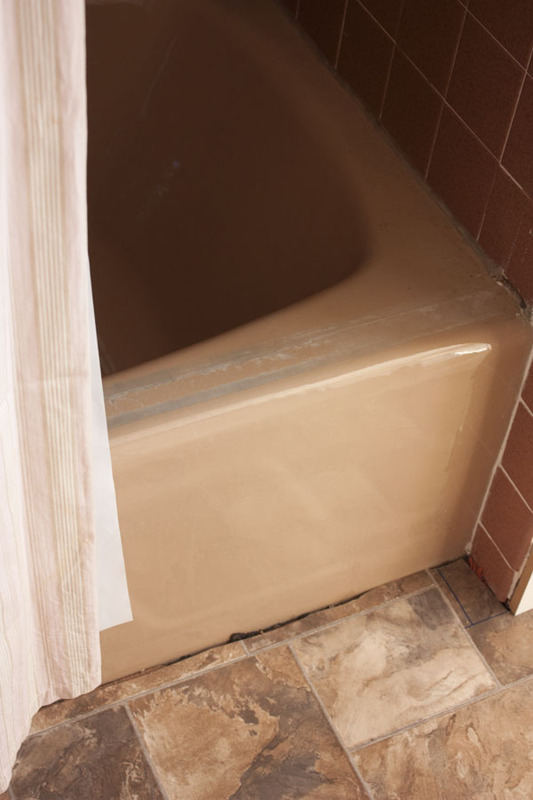 While we were at it we also decided to remove the lace curtains and the old glass shower doors to make sitting on the edge of the tub and bathing kids easier. 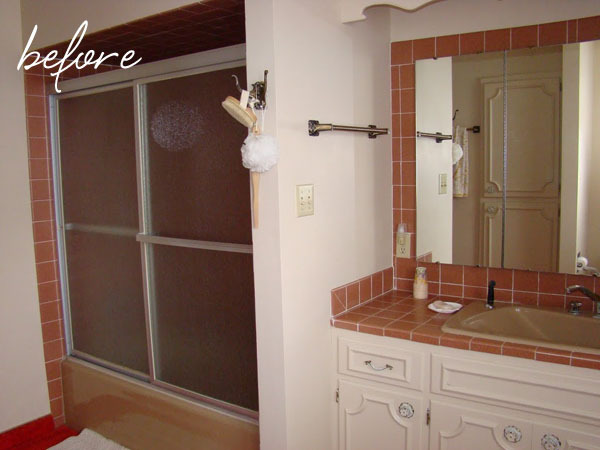 It made a huge difference in opening up the bathroom. It did leave some marks on the tub (that I can't get off despite trying vinegar, lime away, etc.) and some minor holes in the tile, but it was still worth it. I put up the shower curtain from the girl's old bathroom to keep the shower functional. I hesitate to call these "after" pictures, because really they are just temporary. 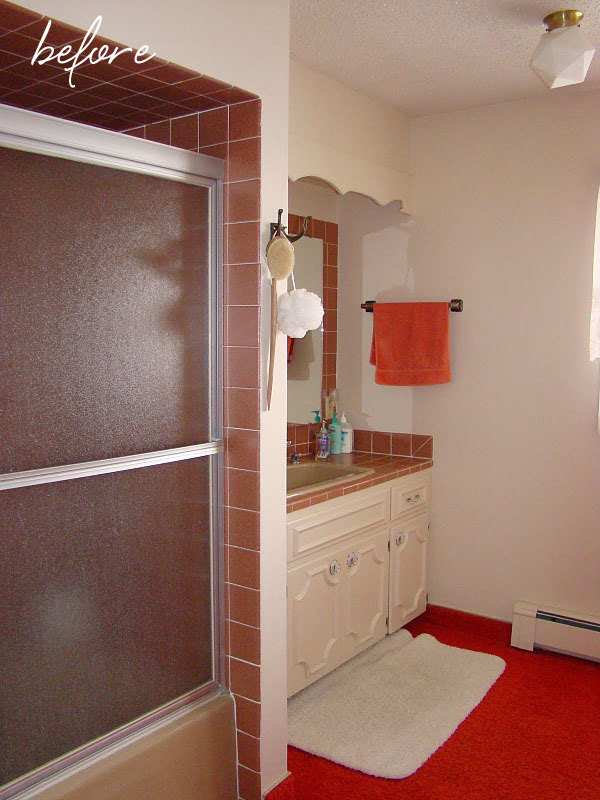 There is still a lot of work to do to improve this bathroom. It badly needs a paint job, for example (as you can see from the marks left by the old register). Tom lightly tacked up some baseboard to hide the unsightly black stuff left by the carpet base, but we didn't even glue the vinyl down. 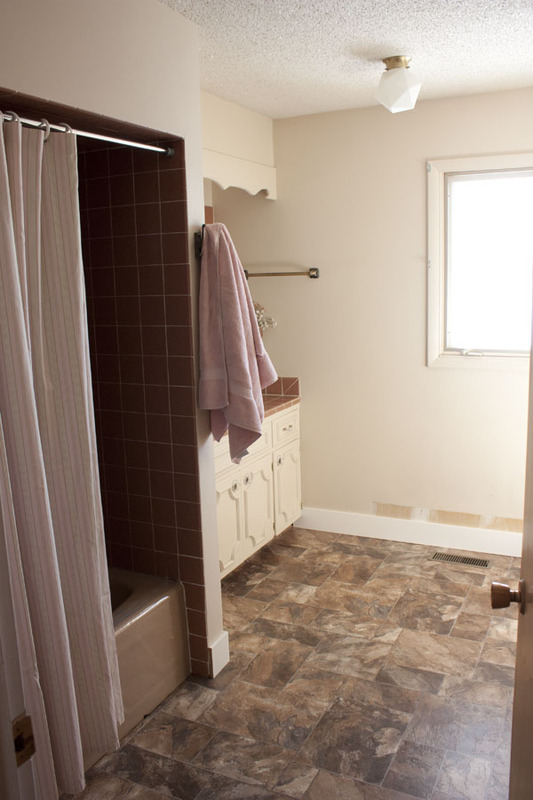 Eventually we hope to completely redo this bathroom; new tub and sink, vanity, and tile floors and tub surround. Even though the guys are saying "whoa, one project at a time, lady! ", I can't help but dream a little about someday . . .
image from Longman & Eagle. I lost the source for this image. If you know it, please let me know. Thanks! I especially love this bottom image. 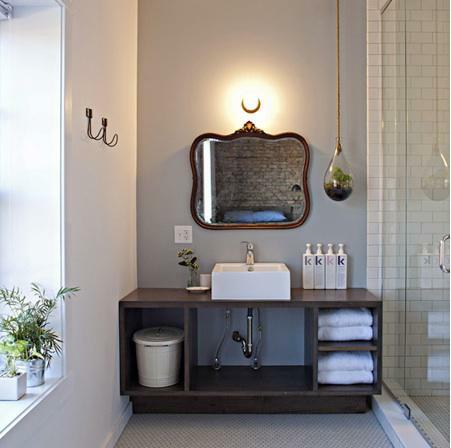 I am inspired by black and white tiled floors, lovely wood vanities (maybe even an old dresser), and unique mirrors. Does anyone miss the red carpet treatment now?